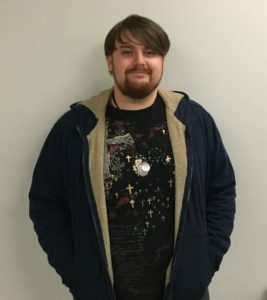 Steven is a staff leader on Mondays and Wednesdays at the Hopkins Pavilion for both skill building groups , and a Game Master for Role playing adventures on both days. He also leads a Saturday group at Dreamers cards and games for a Role playing adventure, as well as one of the miniature gaming groups on that day. Steven loves his work. He describes it as “one of the best activities I have ever done in my life.” What he enjoys most is seeing a participant come in to a group hesitant, and then leaving asking how many groups they can join because they had so much fun. He is amazed at the fact that group leads to such a positive change.